I really like the look of lace, but I am neither the sort of person who has the time to knit a big, fancy lace project nor the sort of person who would wear such a thing if I did knit it. Instead, I much prefer projects that use eyelets and lace in interesting ways that aren’t too time consuming to knit. 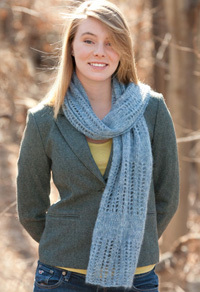 That’s why I like this week’s featured pattern from Classic Elite Yarns, the Pirouette Scarf (link is to a PDF). This scarf features panels of eyelets separated by bands of stockinette, making for an easier, warmer and less-fussy lace scarf. The yarn is a blend of mohair, bamboo and nylon, which makes it fuzzy, drapey and just a little shiny. This one would be great for gift knitting or to make for yourself! I’m with you. I like to knit but I prefer a pattern that doesn’t take too awfully long or is very complicated. This scarf looks perfect to fit the softer but not all girlie-girl side of me. Thanks for sharing.